This past weekend, I brought the wrong cookies to my mother, and I attended a Writers’ Conference in Delaware. Believe it or not, these two disparate comments belong together. Flattered to be invited to attend and speak at the Word Shark Writing Conference organized by Karen Sanderson, editor, writer and blogger, I accepted after realizing I could combine the trip with a visit to my mom, who lives just a half hour away. 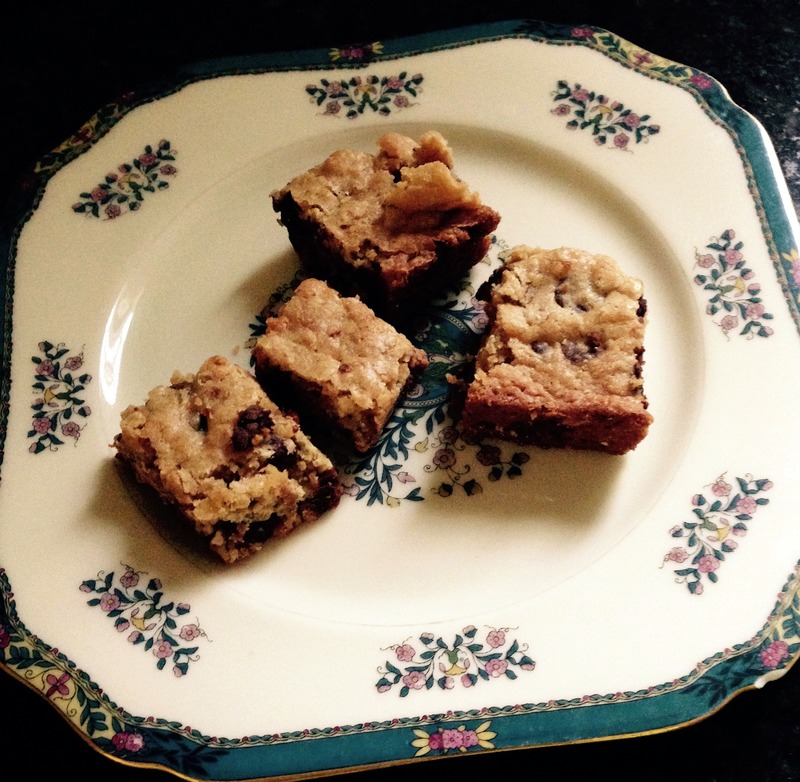 A few days before the conference, I worked on my presentation while also baking my mother’s favorite chocolate chip butterscotch oatmeal bars. My mom doesn’t have a big sweet tooth, but for some reason she absolutely loves my bars. At 5:30 a.m. on the day of my long train ride to Delaware, I grabbed the special bars from the freezer, where I had stored them. Seven hours later I gratefully unloaded my bag with the special treats, basking in my mom’s gratefulness. But as I pulled the bars out of their freezer bag onto one of her antique flowery dainty china plates, I gasped. I had pulled the wrong bars out of my freezer in the morning! 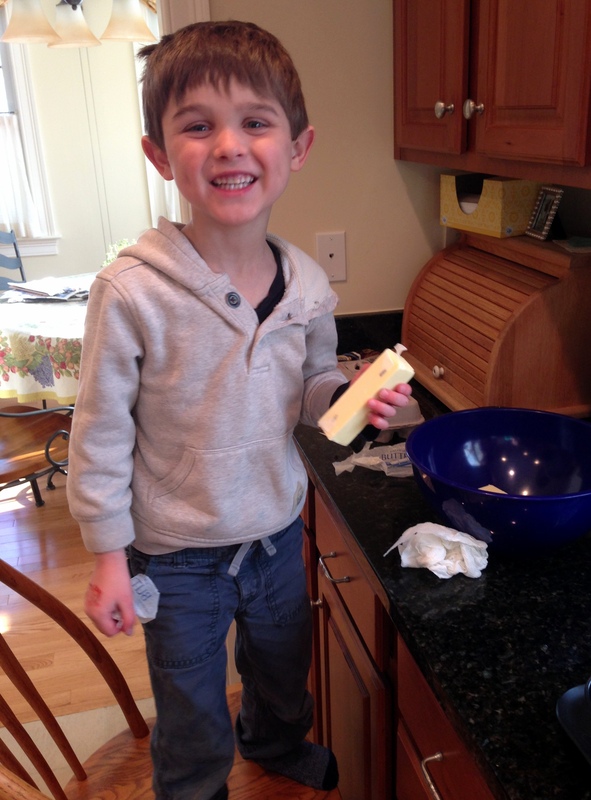 A few days earlier I’d had a special baking day with my 5-year-old grandson, making a new recipe for “O’Henry” bars. They were way too sweet for me, but Clark exclaimed with a worshipful sigh, “these are the best cookies in the world,” so I froze some for his return visits. But alas, now the O’Henry’s were here in DE with my mom, who I was sure would be deeply disappointed that I’d not brought my specialty c.c. butterscotch oatmeal concoctions. Before seeing her reaction, I raced off to the writing conference. In truth, I was quite nervous, not about presenting, but about meeting these writers who I only knew on-line through their blogs. What would happen if, in person, we disliked each other, and had nothing in common? 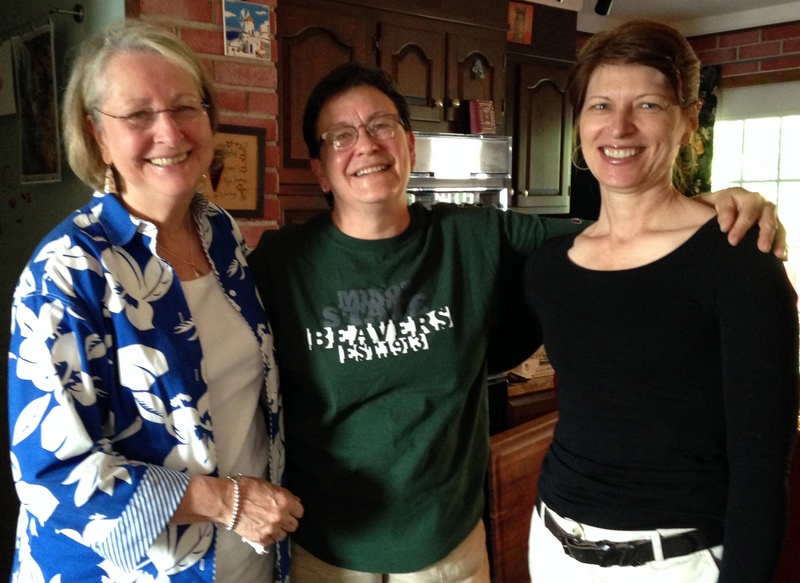 Elizabeth Cottrell, Karen Sanderson, and Jennifer Brown, writers extraordinaire. As I entered the room my worries vanished, and the writing conversation ensued with a combination of wit, wisdom, and ‘what ifs’ that writers share throughout the world. We were all just wandering, wondering writers who connected despite our differences in writing styles/age/experiences. Ribboned in between the practical matters of writing, we all expressed a desire to share our LIGHT in our writing, whether it be through our blogs or books, stories or magazine articles. Call us sappy (and many will), but tired of seeing dark, discouraging words thrown about in the news and blogs, in stories and shows, we all sought for ways to write about the light within the shadows. I returned to my mom’s place, thoughtful. As I walked through her front door, my mom’s head snapped up, looking a bit guilty. “What’s the matter?” I asked. Searching for kindness (and a good cookie). “I just ate another of your O’Henry bars. They are sooo good. I can’t get enough,” she confessed. “But…” I began, ready to remind her that these weren’t her favorite bars, so she couldn’t like them so much. And then I figuratively smacked my hand on my head. She didn’t love my bars because of how they tasted. She loved my bars because I baked them for her. Because I cared. Because through my act of (baking) kindness, she felt loved. And then the discussion from the writing conference all fell into place. Non random acts of kindness – though our writings, our actions, even our baking, these acts shine through the darkness. That’s what the writing light is all about. YOU are a light, Carla, for sure. I wouldn’t call you”sappy” at all, Pam. Lovely post and such a beautiful photo of you and your mother. She looks so pretty dressed in pink. Pink – and teal – are definitely my mom’s colors. Thanks much, Jill. I remember when ‘sentimental’ and ‘sappy’ were dirty words in the writing world, but it reminds me of the Paul McCartney song…”You’d Think That People Would Have Had Enough Of Silly Love Songs. But I Look Around Me And I See It Isn’t So. Some People Wanna Fill The World With Silly Love Songs. Not sappy. Happy! Loved the story about the O’Henry bars and your mom. On-line, with writing, we get to know someone’s ‘spirit’ without benefit of their physical presence. I find that then, when you come face-to-face with them, you still see the spirit first, not the face and body. Pretty cool, huh? Pam. Your blogs speak to me. So I’ve just ordered The Right wrong Man. Hope I get to read it because right now with the upcoming publication of my own book in Jan. and a weekly blog along with 15 Maine visitors so far this summer, reading recedes into the distance. But blogs about joy never do. There is a lot of darkness out there, and much of our fiction weaves it into those worlds, too. Sometimes we yearn for lightness. Glad you were able to find some. Sounds like a wonderful time! You have so many comments on your blog that I’m going to respond to them HERE. You shed some light to me and your readers re your ‘tree cemetery.’ FABULOUS idea – I think I’d like to be a Japanese dogwood. And as far as the apple/doughnut display – that’s pretty criminal, isn’t it? Perfect pix for promoting your new book. I can’t wait to read it. Oh, I’m so glad! A good ‘water park’ page turner of a read! If you feel so inclined, write a quickie review on the Twin Desires Amazon page. Thank you, Dave. A wonderful compliment from you – you’re a wonderful writer. I’ve just downloaded your short story. Happy Father’s Day! Congrats on your first draft – wow! I’m still less than halfway through the first draft of my third book and finding the task daunting. 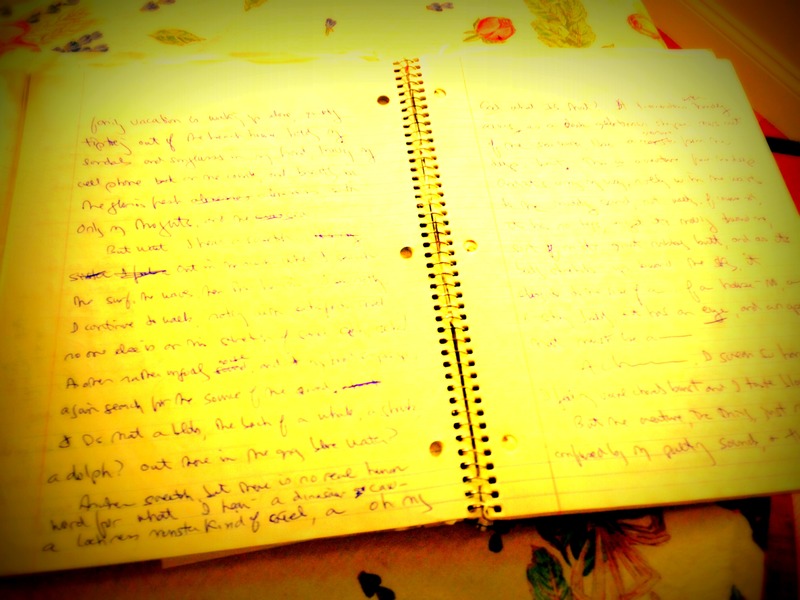 Keep on writing!!! But, it’s your THIRD book. Congrats on that! I’m only 5000 words into my third and won’t be getting back to it for several weeks. Write on! I wish you’d known about the conference too – you would have fit in beautifully with this group! If it happens ever again, I’ll let you know about it. The woman who hosted it lives in ND, but her brother lives in DE so that’s where she held the writing conference. 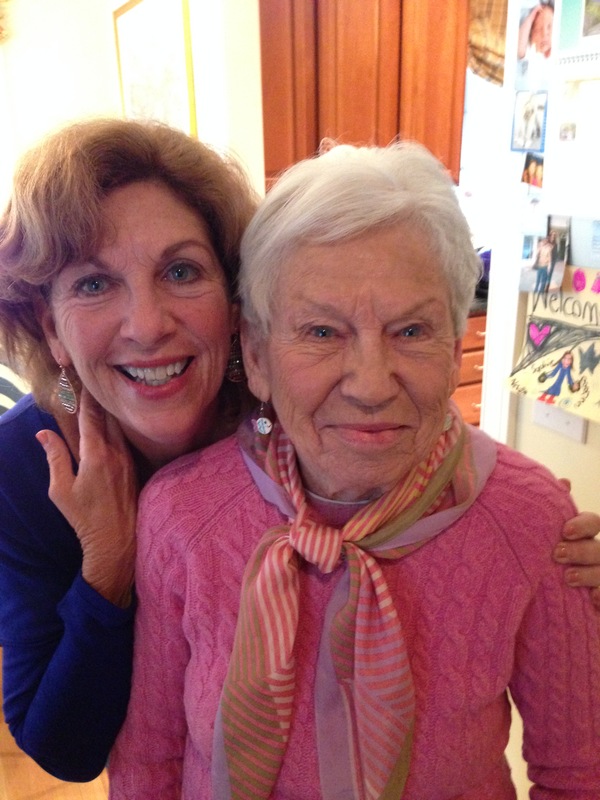 Wonderful post on two fronts: support and friendship from fellow writers and the love of your Mom. I used to cook things for mine, wish she were still here so I could still do it. I got a little teary! Sorry about the tears – I tear up easily: music, blog posts, hello calls from my children/mom, a lick from a dog. Oh dear, I could go on and on! Here’s to support/friendship/love! Lovely post and yes, everything with love feels (and tastes) better. Being with like minded women, who want to share kindness and joy, always shines a far reaching bright light. How exciting to meet your online friends. The cookies are a great reminder to appreciate the love that comes my way…plus I’m sure they were delicious! A sweet story, well told. What a wonderful post. The conference sounds like it was a huge success. So wish I could have been there. I love the tie in with the baking. Everyone wins! Your post warms my heart. Love is all we need, who cares about the cookies. Have a wonderful weekend. Your mom looks gorgeous . Love is all we need, indeed. Love and cookies may be even better. Hope you’re off to Paris, the city of LOVE!! You shine through the darkness, my friend! Glad I dropped by. Now please pass a cookie–any kind! Hmm, perhaps if you resumed your blogging, I’d be tempted to SEND you a cookie! 🙂 As it is, I’m elated that you stopped by here, ms. switcheroo. I love when these kinds of “mistakes” happen! More fodder for our writer’s mind and they often turn out better than what we originally intended. And congrats on the conference! I’m very touched by this post Pam and the combination of events on this day that brought you this insight. Thanks so much Andrea – means a lot, as your posts touch me with their gorgeous writing and thoughts. Your writing today touched a place in my heart. My brother in law, Stephen was always baking something delicious. Whenever I went to visit my sister there was some goody on the counter. He showed his love through his baking and cooking. With his passing I will miss his sweet confections. But most of all, my sister will just miss him being in the kitchen next to her. Love is shown in many ways. Your mother just loved having you there even though they were the wrong cookies!!! Oh my goodness, I can see this beautiful post is just the beginning of the ripple effect of our wonderful weekend together at that writers’ conference. Marnie Pehrson calls us Light Bearers, and it’s true. Whether we’re writers or creatives of another sort, we bear the light of love and lift it up to be “the light between the shadows,” as you so beautifully put it. We also bear witness to the good in the world. I love that all the commenters resonated so strongly with your powerful words. Write on, sister! Thank you for this wonderful bit of light..so badly needed these days. Your amazing photography is amazing because of your use of the LIGHT, Susan!! I’m sure your mom can feel the love in your baked treats, and your students feel the love in your writing class can too – which is why they open up, like flowers to the sun. Thanks a wonderful way to think of it – thanks, Jennifer! Wasn’t it awesome? I was anxious, what if we didn’t care for each other in person…but that thought flew out the window as soon as we all gathered. Wonderful gals, all! I loved your ABC exercise at the conference. I have a feeling that after your post, a lot of people may be trying their ABC’s in a writing exercise! Fabulous. And love the quote you sent me – THANK YOU. It seems to be sadly true that “dark” (grotesque, violent, terrifying, ghoulish, nihilistic) material appeals to large numbers of people, a larger number than the small army of us who want to bask in and share the light. But, we are significant enough, and the more I seek like-minded writers/readers, the more I continually find. Thanks for this! It’s encouraging! I find it odd that more people don’t gravitate to the light and instead seem to savor the scary dark things. I hope that as more of us speak out, and write out about the necessity/sweetness/love of light, we’ll get more on our side! I think it has something to do with negative emotions being so strong, they are almost addictive. And also, with the idea of the “narrow way,” that fewer people are willing to choose gentleness, love, and light, because it’s harder work, and lonelier to walk that path. When I meet blog pals in person, I am always delighted to discover that they are even more fun than their blogs let on — so I am not surprised at all that you had such a good time at the conference. On another note, there is no such thing as a “wrong” cookie. ALL cookies are right. All of them. Never forget this. Well, of course, you are absolutely right. Unless, say, you forget to put the sugar in the batter, or the butter. But otherwise, no cookie should be left behind…. I think a blogging/cookie conference would be fun sometime. Maybe in New Jersey…. Ooh, I do hope that happens! Remember, one of my resolutions was to meet more bloggy pals! I love that – non-random acts of kindness. This has been one of the things I’ve loved about the blogging world is making new friends and the support I’ve gotten from them. It’s a great ah-ha moment as to what happened at both the conference and at home with your Mom. Thanks for following over to my blog from Darlene. I was scrolling through the comments (I love to read what people have to say) and saw her smiling face there. She’s great and a wonderful friend. Pam, what a wonderful post this is! The lessons from the cookie mixup–you’re so right; your mom loved them because you made them for her, and she loves you!–and the lessons and affirmations from the conference all combine to make this a memorable post. Thank you. Here’s to “non-traditional creativity” – and lots of light! Please stop by again!!! But never was the phrase ‘it’s the thought that counts’ so well illustrated. Hope your thoughts are sunny and bright in that lovely piece of land where you live. You are anything but sappy, Pam. Little did I know just how much following my mother’s advice (most of the time), “if you don’t have anything nice to say don’t say anything at all,” would stand me in good stead in the future. May you continue to seek ways to write about the light within the shadows. Love that your grandson and your mom appreciate your baking for them! What a beautiful epiphany you had! And how lovely to bake for your mother! The writing conference sounds heavenly, too! I absolutely loved this post! And I loved the picture of your mom and you. It would be great to attend a conference where you were speaking. Maybe some day! Thank you very much for commenting on my Bed and Breakfast in Maine. Coming from a published Author and teacher is humbling. I am a newbie and haven’t seriously put pen to paper in a hundred years. It encourages me to know you liked enough to comment. Thanks again. Romantic suspense in San Francisco & Stinson Beach. Click on book cover to read more - available in softback or for your Kindle. Page-turning intrigue set in Boston & the Caribbean. 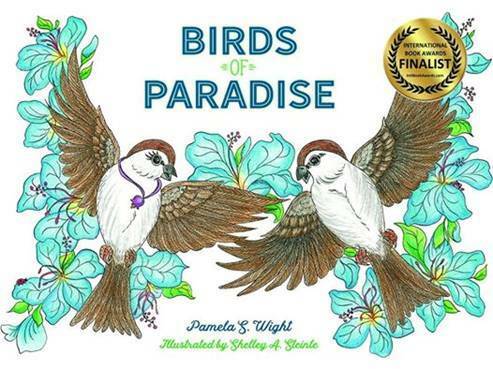 Click on book cover to read more - available in softback or for your Kindle. What Makes a Man "HOT"? Heartspoken Speaking from the heart about life’s esssential connections. heylookawriterfellow Humorous anecdotes about life, with an added bonus of cartoons once in awhile. Lake Superior Spirit Stories on living in a little house in a big woods. Reade and Write Words and wine by Amy M. Reade. Sunny Cove Chef Cooking is therapy. The Write Transition Author, physician, public health advocate, humor blogger, mother, wife, fitness enthusiast . . . and introvert.